You are warmly invited to join us as we offer fresh hope on Mondays. Share an original encouraging quote or Bible verse on social media (like facebook, twitter, instragram) and then add #inspireandgrow to the end of your post. The idea is simple…let’s uplift one another as we head into the week. I would love it if you decide to write a blog post and link-up with us too. I will provide a link-up most Mondays for you to add your post. When sharing your blog post link via twitter or facebook, add #inspireandgrow. You can also add me @ImprintsKatie to the share message too. When posting please mention that you are linking-up with Katie Reid for #inspireandgrow (and link them back here for instructions http://www.echoesofmyheart.com/2/post/2014/04/1.html). Thank you! Join us on Mondays as we offer fresh hope for the upcoming week. Let’s uplift one another with inspiration to grow as we share what God is teaching us. 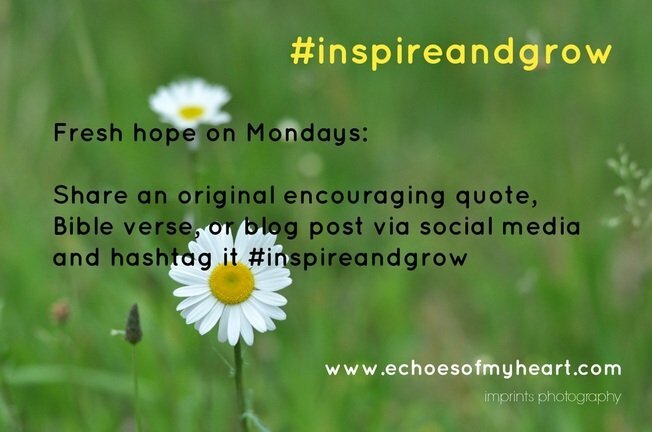 Add #inspireandgrow as you share your blog post on social media and/or also share original quotes or Bible verses on Mondays (via social media) and add #inspireandgrow. Hebrews 10:23-25 is the foundation for #inspireandgrow, “Let us hold unswervingly to the hope we profess, for he who promised is faithful. And let us consider how we may spur one another on toward love and good deeds, not giving up meeting together, as some are in the habit of doing, but encouraging one another—and all the more as you see the Day approaching” (emphasis mine). So, let’s meet here each week and spur one another on with hope and encouragement! Link-up your blog post and then encourage the person in front and behind you in the line-up. :) Please mention you are linking-up with Katie Reid for #inspireandgrow in your post and link them back to the instructions (http://www.echoesofmyheart.com/2/post/2014/04/1.html), thanks! Compare an aspect of Spring to something that God has taught/shown you. Besides God, who inspires you? How have they helped you grow?